We have been so excited around here as our Wisconsin Badgers are in the Final Four. Last Saturday's win against Arizona was the most suspenseful and exciting game I have ever watched. The game is tonight against Kentucky and we are all hoping for another win. Hopefully it won't be as suspenseful because I don't think my heart can take it! We are so very proud of our Badgers and coach Bo Ryan. GO BADGERS! 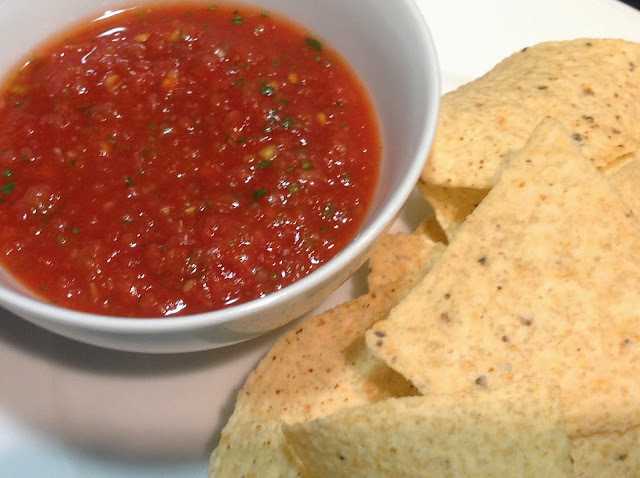 This is my favorite, easy, anytime salsa. It's a perfect snack for the game and it's Badger Red! The easy part is that it all goes into a food processor, a few pulses and it's done. Also you don't have to wait for tomato season to make this as it uses canned tomatoes. I love the bright red color and the bright fresh taste. I'll go as far as saying this is better than the salsa I make with fresh tomatoes. This recipe comes from Pioneer Woman. Check out her recipe here as she has step by step photos. With all her recipes, once you look at all the photos, you want to make it! Everything that I've made from her blog and cookbooks have been delicious. Now that the salsa is made, I'll just relax and enjoy a sample before the party starts. YUM! This is a very large batch. Recommend using a 12-cup food processor, or you can process the ingredients in batches and then mix everything together in a large mixing bowl. Combine whole tomatoes with 1/2 of the juice, Rotel, onion, jalapeno, garlic, sugar, salt, cumin, lime juice, and cilantro in a blender or food processor. Pulse until you get the salsa to the consistency you'd like adding more of the tomato juice if needed. wonderful guide!!! thanks for this food guide.Thanks for sharing.